As a koi hobbyist and having the opportunity to be around other koi hobbyist, many discussions of various topics relating to the hobby are talked about. In the course of these conversations we usually talk about the reactive action of situations that we have experienced with our pond construction, water quality, koi health and etc. Which brings myself to writing this short article about being “proactive” verses “reactive”. As Dr. Eric Johnson, DVM, mentioned during his talk at the recent PNKCA Convention, “KHV is out there, there isn’t a state that has koi in it that it isn’t present.” With that said, that is one of the foremost things in the koi hobbyists mind today, the safety of my koi. However, instead of sitting and waiting for some cure to magically drop into our hands, there are preventive steps that can be taken by the hobbyist and clubs. With the Northwest Koi & Goldfish Club 25th Annual Koi & Goldfish show approaching, July 30th & 31st, a group of “Proactive Koi Hobbyist” and the club board members decided to take steps to address and improve the safety of our wet scaly friends. 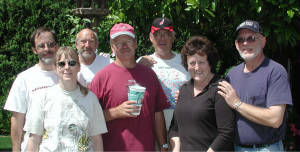 Last weekend this group rallied around a club member’s home and started construction. Have you ever heard of a show tank with water wings? Well, they aren’t really water wings. They are referred to as “splash guards”. Now this idea isn’t a new concept. Splash guards were used at the Japan Koi Show, and the picture insert here, is what was used at one of the California Koi Shows, compliments of Spike Cover and Burt Ballou. 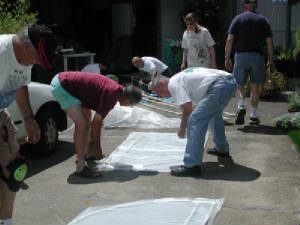 So with some purchased and donated materials, Bob Johnson, Leo Marsh, Jerry Karo, Dale Rohrer, Gary GeRue, Donna Mason, Joan King and last but certainly not least, Don King gathered around the pvc pipe, a roll of rip-stop plastic sheeting (donated by Pete Miller), and begin creating splash guards to insert between the show tanks at the upcoming koi show. The splashguard is another preventive step to provide safety for our koi while attending a show and providing the koi owners with some additional insurance that measures are being taken to provide a safe environment for our wet scaly pets. 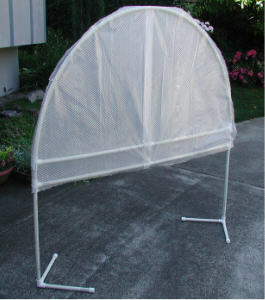 In the meantime, I have had the opportunity to discuss the splashguard concept with a couple other koi clubs in the Northwest, and their Show chairs and boards have approved going ahead with the concept. 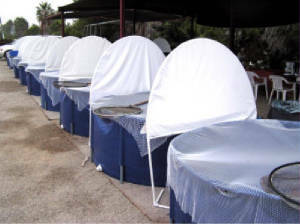 So, as you make your way around to the various Koi Shows here in the Northwest (go to the Calendar of Events page for dates & locations), you will see different approaches taken to safeguard from possible cross contamination between show tanks. This is being proactive from my standpoint instead of being in a reactive mode. I just wanted to share this information with you because I thought it was neat that we have so many consciences koi hobbyist and friends out there that share the same love and addiction to koi.